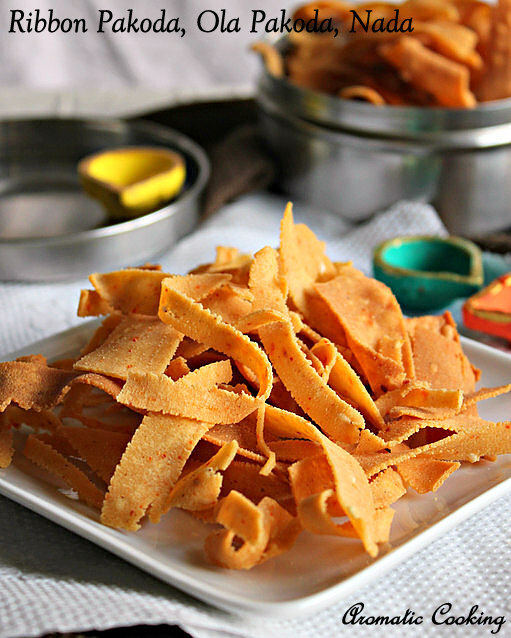 Ribbon Pakoda called otherwise as Ola Pakoda, Nada or Ribbon Murukku, is one of the easiest snack that you can make for Diwali. The dough is simple and there is no particular shape to be followed like the regular murukku, so it's once again a beginner's dish. Just adding the right amount of fat to the dough and frying it properly is all that's required to get good Ribbon Pakodas. I have made it mildly spicy and added sesame seeds for flavor and they came out very crispy, another snack that would go perfectly with a cup of tea or coffee.. Grind the Roasted Gram Dal into a smooth powder and take 1/2 cup of it. Sift together the rice flour, gram flour and roasted gram flour. Add the sesame seeds, red chilly powder, salt, butter and hot oil and mix it together. Adding water little by little, make a stiff dough. 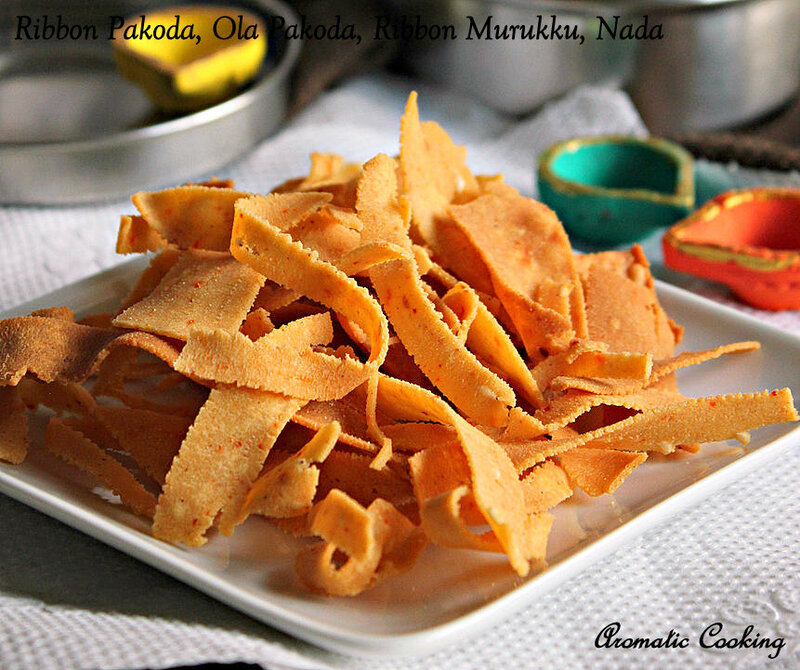 Take the ribbon pakoda plate and use it in the murukku press. 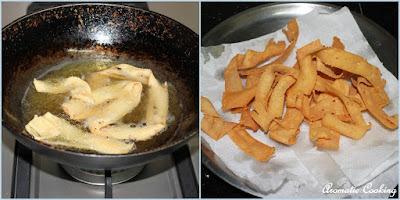 Heat the oil, squeeze out the dough directly in the oil in a circular portion and fry till the bubbles settle down. Remove and drain the excess oil, cool it completely and store it in an airtight container. The oil should be at a proper temperature, test it by adding a little bit of dough in the oil, it should rise up to the top. If the ribbon pakoda plate hole is very small, then the sesame seeds might get stuck, in the case avoid the sesame seeds, add some asafoetida for flavor. You can also grind dried chillies with 3 or 4 cloves garlic, add the paste to the flour and make the dough and make the ribbon pakodas. Today morning I had this. .one of my neighbour gave me .loved it..thanks for sharing it..now I can try. My another fav after thenkuzhal ..very addictive one . crispy and addictive snack.. Happy Diwali Hema! looks super tempting ...crunchy ones! !